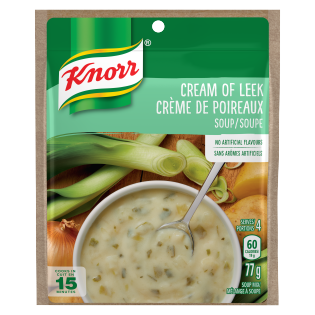 Knorr Leek Soup Mix allows you to easily add the delicate taste of leek to soups, dips and more. Our delicious mix adds a wonderful hint of mild onion flavour to hearty dishes like our Classic Potato Leek Soup. Dried vegetables (onions, potatoes, leeks), corn starch, wheat flour, hydrogenated soybean oil, modified milk ingredients, corn syrup solids, salt, monosodium glutamate, hydrolyzed corn protein, guar gum, leek flavour, potassium phosphate, sodium silicoaluminate, spice, canola oil, colour and sulphites.